The present-day site of the village dates back to the late 17th century, when exploitation of cork from Cortes’ abundant cork oak groves stimulated economic development in the area. The village’s main architectural structures also belong to this period: the Town Hall (1784), Our Lady’s Church, the Valdenebro family seat (1763) and a building known as the Stone House. In the western part of the village, wedged between the provinces of Malaga and Cadiz, are the remains of the village of La Sauceda, once home to bands of 16th-century highwaymen and mentioned in Cervantes’ ¨Coloquio de los perros” (“The Dogs’ Conversation”) and ¨Vida del escudero Marcos de Obregón¨ (“The Life of Squire Marcos de Obregon”) by Vicente Espinel. The village was bombed and totally destroyed during the Civil War, and has remained uninhabited ever since. Remains of settlements dating back to the 12th or 11th centuries B.C. are to be found within the present-day boundaries of Cortes de la Frontera. The Romans made the biggest mark, establishing towns such as Saepona, known today as Cortes el Viejo, which stands some 28 kilometres from Cortes de la Frontera. The Arabs called the village Cortex. It was conquered by Ferdinand III, known as the Holy, though it was only briefly in Christian hands, returning once more to Arabic rule before its definitive capture by troops of Catholic Monarchs in 1485. 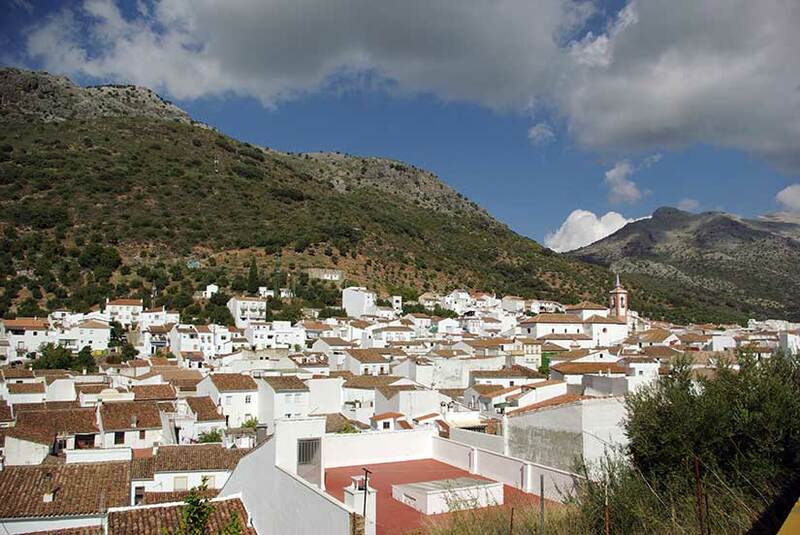 Cortes became a border village between Christian territory and the last bastions of the Andalusi-Arabic empire, which explains the addition of “La Frontera” (“The Frontier”) to its name. The present-day location of the village dates back to the second half of the 17th century, when cork exploitation on Cortes’ communal lands gave rise to considerable economic development which proved vital to the village’s growth..
Another key event in the village’s history occurred in 1810, during the War of Independence, when the guerrilla Jose de Aguilar led 250 men from Montejaque, Cortes de la Frontera, Benaojan, Atajate and Jimera de Libar to victory against 600 French infantrymen and 90 cavalry at the bridge over the River Guadares. The importance of the exploitation and commercialisation of the village’s cork oak forests came to the fore in the 19th century, and Cortes de la Frontera became one of the five richest municipalities in Spain. In the western part of the municipal area, among the magnificent forests in the foothills of the Sierra del Aljibe, stand the remains of the village of La Sauceda, legendary as refuge for bands of highwaymen in the 16th century. It was completely destroyed during the Civil War, since when it has been completely abandoned.